What do you do when you read a bestselling tidying book, have applied the methods successfully, and feel that you can take the principles further in other aspects of your life? Why not create a parody? Or you read a bestselling tidying book, and completely disagree with the concepts involved and think you can provide a better alternative? Create a parody of course! 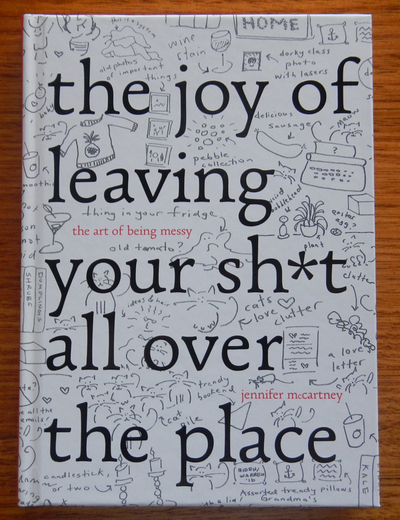 Following the success of Marie Kondo’s #1 New York Times bestseller The Life-Changing Magic Of Tidying, there has been a surge of similar cleaning and tidying books hitting the market, all extolling the virtues of a de-cluttered life. 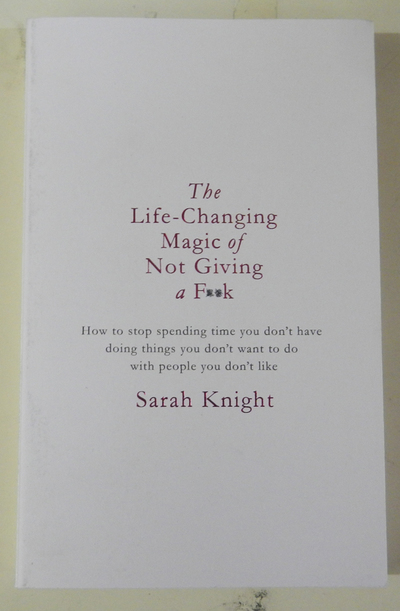 Likewise, there have been just as many books released which parody this successful and popular addition to the self-help genre. While some of them tackle the physical aspects of messiness and tidiness, others focus more on the ‘psychological’ and emotional benefits that can be gained from ignoring the advice of the original books. 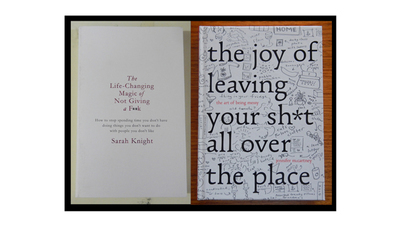 Two such books, The Joy Of Leaving Your Sh*t All Over The Place by Jennifer McCartney and The Life-Changing Magic Of Not Giving A F**k by Sarah Knight, take the de-cluttering genre to a whole new level, insisting that messiness is a sign of a life well lived and that those who want neat and tidy homes are quite literally insane. They live by the belief that tidiness does not equal happiness and that having a cleaner house will in no way improve other aspects of your life, despite Kondo’s certainty that this is the case. Their advice is pretty much the opposite of what Kondo recommends- McCartney suggests that having more stuff makes you happier because you only live once and why not buy what you want, when you want it, so you can enjoy it in the time that you do have. She believes that getting rid of things will only lead to heartache in the long term, especially if you find that you are living in a sterile box with minimal things surrounding you. She also lists the benefits of a ‘messier’ life, such as always having what you need on hand in the car if you happen to get stuck on the side of the road in a blizzard (although that isn’t as applicable in Australia)- leftover food, discarded clothing, and an old magazine to read can apparently come in very handy to pass the time and keep you warm! In the event of Armageddon, having extra stockpiles of food in your pantry will be a godsend, and never mind about storing things away, because everyone knows that you’ll never be able to find them if they’re not sitting in a pile on the floor where you last left them. In a slightly different train of thought to McCartney’s ideals, Knight looks at the emotional aspects of ‘tidying’ your life. She suggests cutting out the people that make your life hellish, boring or lackluster, including workmates, associates, friends and family, and saying a big ‘F you’ to the consequences. She believes that with the right approach, you can tidy your life of the people you don’t like (although it must be done politely of course) and in effect, improve your entire wellbeing. She admits that some people may be difficult to remove completely (especially particular family members) but that it is possible, and that the gains will be momentous. This ‘parody’ actually contains a lot of truths that could be beneficial for some people, although it still makes a mockery of Kondo’s belief system. While both of these books are parodies, they also contain elements that many people will relate to. You will also find that both books are littered through with words like sh*t and f*ck (Knight’s, especially), perhaps to help differentiate between their books and the polite manner that Kondo’s books are written in. The language variances are fairly obvious through their titles, although don’t let this be a deterrent, because there is actually a lot to be learnt through the reading of these ‘different’ self-help books.